Police have deployed tear gas to disperse some 2,000 protesters, who rallied in Kosovo’s capital, Pristina. The demonstration called for the dismissal of a Serb minister accused of insulting Albanian war victims. Aleksandar Jablanovic, the minister for communities and returns of Kosovo, sparked anger earlier this month when he branded as “savages” a group of Albanians, who blocked a group of Serb pilgrims from entering an Orthodox Christian Church in the town of Djakovica. On Tuesday, large crowd carrying Albanian flags took to the Pristina streets demanding dismissal of Jablanovic and the entire cabinet. The rally was organized by several opposition parties, including the nationalist Vetevendosje (Self Determination) party, reported Balkan Investigative Reporting Network, a news service focusing on the Balkans. The crowds clashed with police when they tried to push them away from the government building near the central Skanderbeg Square. Officers used tear gas and water cannons to disperse the rally, the Balkan Insight news portal reports. Dozens of people were reported injured in the scuffles. 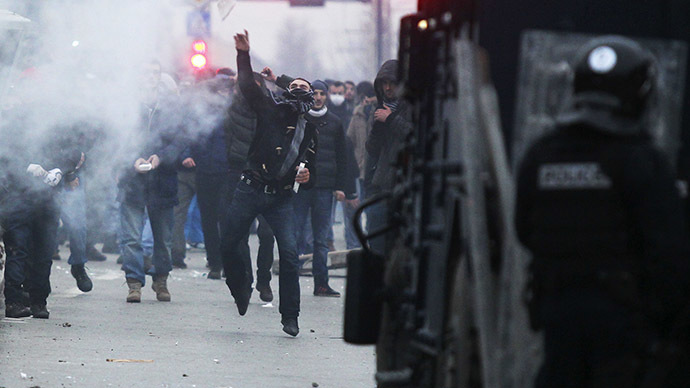 Live footage from the scene also showed a number of people were detained, with Kosovo's mayor reportedly among them. The rally on Tuesday follows a much larger protest on Saturday, which also escalated into violent clashes between the demonstrators and police. The protesters demanded that Jablanovic be sacked within 48 hours, but the government rejected that demand. “The government of Kosovo urges political parties and their leaders to fulfill their goals and political ambitions through free and democratic elections, and not to use various pretexts to achieve political goals in an undemocratic way,” Prime Minister Isa Mustafa told a government meeting. Jablanovic, who is one of three Serb minister in the Kosovar government, has since apologized for his remark. The site of the Albanian-Serb confrontation, which served as the trigger of the conflict, was a scene of heavy fighting that resulted in many deaths during the Balkan wars. The minister said he was not aware of the tragic history of the site. Another grievance voiced by the protesters is the government’s decision to exclude the Trepca Combine, a mine contested by Belgrade and Pristina, from a draft law on public enterprises. The law would lay a claim on 100 percent stake of the mine for Kosovo. But the government made a last-ditch exception for the facility after Serbia warned against attempts to seize the asset and complained to the EU about Pristina’s intentions. The protesters chanted “Trepca is ours!” at both the Saturday rally and the latest protest. The Republic of Kosovo, a partially recognized state, became independent in 2008. Among the countries which recognized the republic’s status were the US, Canada, Australia and some countries of the EU. The majority of the 1.8-million population is Albanian - 92 percent - and only 4 percent Serb.